Takeaway: The condition of the soil can add challenges to auger boring. Here's what to keep in mind when planning an auger boring project. It’s a maxim in auger boring: A rock auger will cut dirt, but dirt auger won’t cut rock. 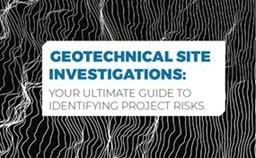 A geotechnical report contains a soil condition report that gives you the lowdown on the dirt and rock at a location. Once you have this information, you face a handful of decisions to make – about siting and stabilizing the auger, the type of bit you’re going to use, when and where you need to use each type. No matter what type of stabilizers your auger drill uses, always put a stabilizer pad on the ground and lower the stabilizer onto the pad. The pad distributes the weight placed on the stabilizer to a larger piece of the ground than the stabilizer alone. This helps prevent one side of the auger drill truck from sinking into soft soil. If you work in a muddy location or anywhere the soil and rock may slide or shift, keep an eye on the level indicator to ensure the auger’s drill angle doesn’t stray. On any auger boring job, the choice of the auger bit depends on the soil conditions you face. The inherent moisture content, moisture added to the ground by infiltration, ice or snow, groundwater level or gravel and rock all have a say in the matter. Use the wrong tool and you might end up with damaged equipment or wasted time, both of which eat into profits. Using the right tool is often one of the keys to most jobs. In horizontal auger boring, the first choice is between the pilot tube and the core barrel. A pilot tube must be able to displace the soil through which it is boring. To do this, the soil’s standard penetration blow counts (N-values) must be no greater than 50. If the blow count’s above that level, it’s necessary to switch to a steerable head. The steerable head is equipped with a lead casing section and four hydraulic wedges facing outward, away from the head, and spaced equally around it. Each wedge can deliver 24,000 pounds of thrust to deflect soil away from the head. Read the auger’s specifications to find out what it’s designed for. The pilot bit’s teeth are specific for each type of boring. Some can accommodate compacted soil, soft shale and stiff clay. Others, like the carbide rock auger, are designed for limestone, sandstone and frozen ground. Use a core barrel when you can’t drill with conventional rock auger tools. This is likely to happen when conditions such as fractural and non-fractural rock, and non-reinforced and reinforced concrete are present. Last week’s heavy rains may have a say in your boring project, in the form of infiltration. Be ready to use drill buckets when you find yourself augering through nearly liquid mud or groundwater. These conditions not only affect your drilling methods, but will impact the way the mud is removed from the hole. Fortunately, there is a means to counter this problem: the drill bucket. Drill buckets – a.k.a. mud buckets – are specialized tools to remove drilling fluid (“mud”), or a mix of drilling fluid and dirt, from a bore. They come in two varieties: The spin bottom and the dumped bottom. Both are effective for displacing wet soils. Ice has little effect on most projects, but if the ground stays frozen for a significant part of the year, permafrost – that pesky layer of permanently frozen soil that lies just below the surface in areas near or above the Arctic Circle – creates interesting problems for drillers in northern climates. Don’t be afraid to be as creative as the weather. A spiral rock bit can be used to drill through permafrost. When it comes to auger boring, proper planning and preparation are key to a successful project. Being sure that you have the tools you need, you understand soil conditions, and everything is set up properly are the first steps to a problem-free auger bore.